Turquoise Bay Golf & Spa Residence is one of the best properties listed in Cyprus44 property reviews. The Turquoise Bay Golf and Spa Residence is a development by Turtle Bay Properties. Turtle Bay Properties are a North Cyprus development consultancy and estate agency, which are based in Karakum, North Cyprus. Turtle Bay Properties sell property in several countries including Brazil. 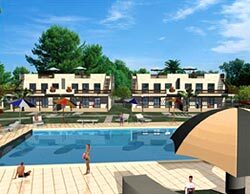 The company is based in Marbella, Spain, where they first began selling homes and apartments twenty years ago. In 2004, Turtle Bay Properties became the sales consultants for Savayon Developers, a major North Cyprus developer. The Turtle Bay North Cyprus property portfolio contains the Turquoise Bay Golf and Spa Residence, plus five separate Turtle Bay branded sites, and villas at Nature Bay Village. The Turquoise Bay Golf and Spa Residence enjoys an enviable position just 500 metres from the new 18-hole championship golf course at the Korineum Golf Club. (It is literally just across the road from the Club entrance.) The development site consists of a curving road that runs almost to the beach at one end and into the green space at the other. The apartments lie off this central road, closer together at the sea end, and more spaced out at the green park end. The two storey apartment blocks at The Turquoise Bay Golf and Spa Residence have a modern, clean look from the roadway outside, their stairwell window almost Art Deco in styling. The non-road facade is more welcoming, with terraces and balconies, and pergolas to keep off the midday sun as you enjoy lunch. Inside, you can customise the apartments to your personal choice as the Turtle Bay properties offer you a choice of flooring, tiles, kitchens and bathroom fittings. All bedrooms come with fitted wardrobes, and the pipework is already installed for central heating should you wish to have your apartment rented year round. Air conditioning and white goods are included as standard, which makes a nice change! The facilities at The Turquoise Bay Golf and Spa Residence include four large outdoor and children's swimming pools, a restaurant, bar, tennis and basketball courts, and, of course, access to the golf course - their own mini golf course! There will be a fitness centre, comprising a steam room, sauna and gym, plus an indoor swimming pool for the winter months. During the summer, it's just a short walk through the The Turquoise Bay Golf and Spa Residence development to the sandy beach beyond. Nature lovers can watch sea turtles bury their eggs during the breeding season on Turtle Beach, which is just a five minute drive away. The Turquoise Bay Golf and Spa Residence is also just fifteen minutes away from the lovely harbour town of Kyrenia, perfect for a romantic al fresco dinner on warm North Cyprus summer evenings. The Turquoise Bay Golf and Spa Residence offers competitively priced apartments, and the package price also includes all white goods and air conditioning, so often expensive extras at other developments. Cyprus44 forum members report excellent experiences buying at sister development Turtle Bay Village, and there is a flourishing Turtle Bay Village community, who chat online at a forum hosted at MSN. Turquoise Bay Hows it looking ? This web page is served on 20 April 2019 at 00:02:52.